lahznimmo architects in association with Wilson Architects were commissioned by UNSW to refurbish and expand the Wallace Wurth Building for UNSW Medicine and the Kirby Institute. The project realises stage two of the University of NSW Biomedical Research Precinct following the recent completion of the Lowy Cancer Research Centre also by lahznimmo architects and wilson architects. In this second phase of works the existing Lowy collaborative “bridge” which links into the Wallace Wurth Building is able to be extended into a new central atrium space. The result is a flexible research facility with an interconnected floor plate between the two buildings, which accommodates 200 researchers per floor. The atrium space is created by a new six storey linear wing along Botany Street which runs in parallel with the existing Wallace Wurth Building. The building contains three distinguishable types of spaces: undergraduate medical teaching spaces, wet research laboratories and dry research office spaces and has a GFA of 23,000 sqm. The external expression of the building responds directly to this division as the facade is horizontally divided to reflect the varying qualities of these spaces. The use of transparent glazing between these spaces and the central atrium that runs the full length of the building instills a positive sense of collaboration. The ground floor and level one contain undergraduate teaching facilities including: lecture theatres; flexible dry teaching spaces; group scenario teaching rooms; clinical skills and exercise physiology suites; anatomy and wet teaching laboratory spaces. Levels two to four consist of a combination of microbiological research laboratories and associated office write up spaces. The top two floors are occupied by a separate tenancy for the Kirby Institute accommodating its research laboratories including a PC3 suite, and dry research office spaces for almost 300 researchers. 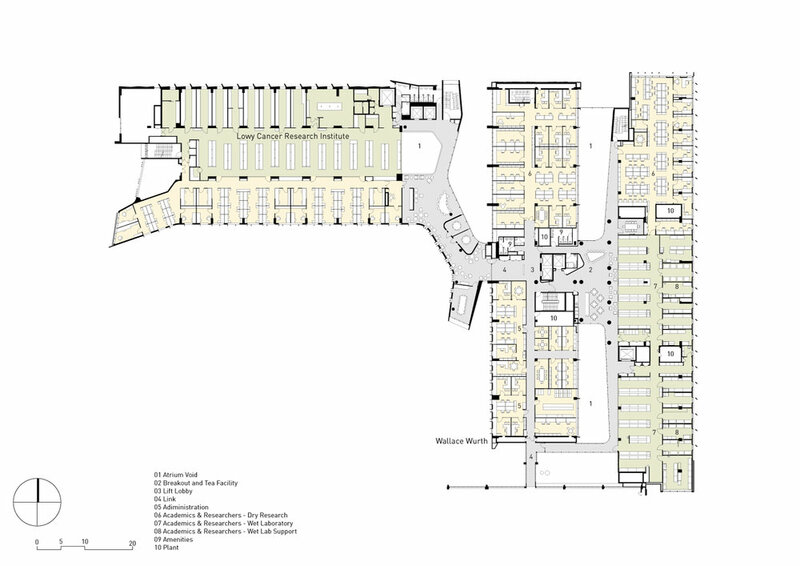 The whole redevelopment accomodates over 1250 students and 750 research personnel. The facade responds to the program within, generating varying architectural expressions. The Wallace Wurth Building sits on a prominent corner of the campus and creates a cohesive relationship with the adjacent Lowy Cancer Research Centre by extending the precast language around the corner.